A luxury dark chocolate bar made from Madagascan beans with added salt and cocoa nibs, created by artisan chocolate maker Menakao. Whilst we are normally purists when it comes to single estate dark chocolate, we make an exception for this Menakao dark bar. This is an example of chocolate with inclusions done right. The chocolate is full of the typical pronounced berry notes of Madagascan cacao. The added cocoa nibs (the purest form of chocolate, pieces of dried and fermented cacao beans) give a powerful crunch, bursting with fruit and tannins, combining deep flavour with added texture. The hint of sea salt serves a double purpose. It opens the palate, helping you to get the full flavour of the berries and red fruits. At the same time, the salt cuts through some of the nibs’ intensity, revealing their roasted fruit and raisin notes while reducing the bitterness and prolonging the finish. It’s the natural purity of the salt that makes this combination so complementary, imparting a delicate flavour, perfect for really bringing out the cacao’s fruitiness without overpowering the chocolate. It’s a purity derived from the simplicity of its production process; Fleur de sel forms naturally on the surface of clay basins as sea water evaporates, and is then hand-picked with a rake. This bar showcases the very best of Madagascan produce. Beans are sourced from the Menakao plantation located in the celebrated cacao growing region of Sambirano, north west of Madagascar, with the fleur de sel, or sea salt, picked from the salt marshes of Morondava in South West Madagascar. 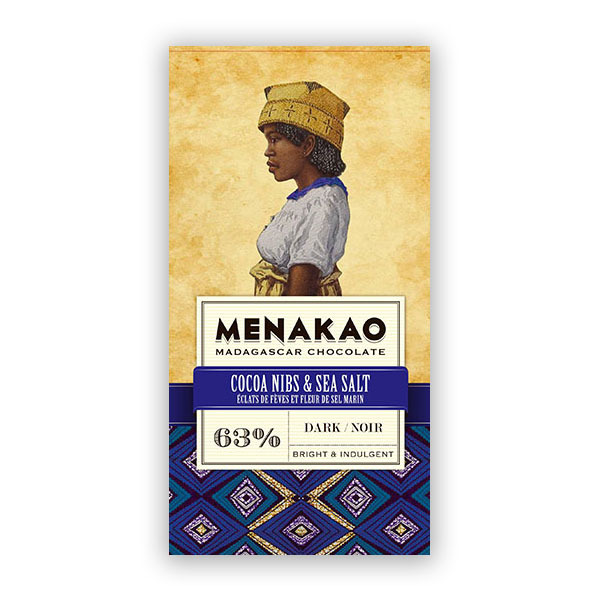 In honour of the men and women of Madagascar of all ethnicities who are at the heart of Menakao chocolate, Menakao decided that the bars should proudly bear the image “not [of] the face of Madagascar, but [of] Madagascan faces.” The beautiful image on the wrapping of this bar is of a Tanala woman. The Tanala people, (Tanala meaning “forest-dwellers”), originate in the heavily forested south east of the island, between the highlands of the Antemoro and the coast. The bounty of the forest provide the Tanala with all they need to live, from hunting to the medicinal benefits of limitless plant species, from wild honey to coffee and rice cultivation. A fine example of a single estate inclusion bar, we think everyone should try it. Cocoa beans, cane sugar, pure cocoa butter, (emulsifier: GMO-free soy lecithin), sea salt. Yum! Rich and smooth chocolate balanced by the smoky nibs has a pronounced fruity, roasted note that I can't get enough of. Definitely a repeat buy! I loved this chocolate! I tried to make it last but it was gone in 2 sittings! Yummy!! I am not usually a fan of added bits into chocolate but I think that Menakao really make it work. The nibs enliven the chocolate and the sea salt, successfully blended in, prevents it from being too bland. It looks glossy and tastes chocolatey. However I dont feel that it deserves four stars as it does not bring anything else to the table and, while simple can be brilliant, it is not quite pulled off here. Utterly delicious - I really like sea salt with dark chocolate and the cocoa nibs give a lovely crunch.